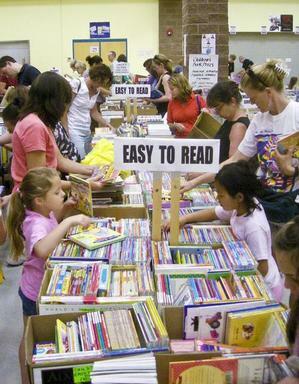 A major used book sale is happening this weekend in Newtown, CT, at the 43rd annual C.H Booth Book Sale taking place at the Reed Intermediate School on 3 Trades Lane from July 7-11. Organized and hosted by the Friends of the C.H. Booth Library, all proceeds from the sale go towards enhancing the library’s current collections, support library services, and fund various adult and children’s literacy programs. Collectors of Beat Generation writers would do well to to set their alarms for opening day: This year’s sale includes a selection of first editions by authors like William Burroughs, Allen Ginsberg, and Jack Kerouac, many of which hail from the estate of a local book collector. A very good copy of Kerouac’s 1965 semi-autobiographical Desolation Angels can be had for $75, while a good signed first edition, first printing of Burroughs’ The Ticket that Exploded is available for $500. Francophiles might be tempted by a 13-volume set of J.J. Rousseau’s Works, translated in English and published in 1767. The entire lot is priced at $1,000. The sale also includes an assortment of 19th-century calendar books, signed children’s books by the likes of Tasha Tudor and Steven Kellogg, puzzles, and other board games. Students might even find a couple of textbooks for the fall. In short, the C.H. Booth Friends Sale has something for nearly everyone and at prices that can’t be beat. Numbered admission tickets become available on July 7 at 7am. There is a $5 admission fee on Saturday only. Get there early–we hear the line forms quickly. Further questions, including driving directions and parking, can be answered at the Friends FAQ page. Happy Hunting!